Raulf is a rather tall and large Wolfen from the Iron Claw tribe. Most of his fur is pure silver; the only exceptions are 4 lightning bolt shaped marks. They are black as the blackest coal found under the earth. The locations of the marks are his right cheek, over his heart, and one on each of his biceps. He wears two piercing ensigns; one for his rank in the Imperial Army, red with 3 black pips; the other for his title and position in his tribe, regal purple with 3 royal blue stripes. Both are in his left ear, the nobility ensign is worn higher than the military. He has a very muscular body. He is so well defined that you can see some of the definition through his fur. The last thing that makes him astonishing is his piercing ice blue eyes, when he stares you down, it’s like he is staring through your soul. True Name: Jelkna Gefra, Shel-na gef-Ra, (The Fist of Ra). Horus’ Beak 3D6 +1 v. magic, +2 v. HF, POIS, DIS. 1. Strike and parry simultaneously. In other words, warriors skilled in paired weapons can often perform two actions for every one melee action/attack. 2. Twin, simultaneous strikes against the same target. Both weapons hit, but is considered ONE melee attack/action, (roll only once to strike). The defender can only try to parry one of the weapons in the parry! The other will strike, unless he too is using two weapons, or a weapon and a shield, and has the W.P. paired weapons skill. 3. Strike two different targets (or strike one and parry the other), simultaneously; both must be within reach. 4. Parry two different attackers; one with each hand. Weapons are limited to the one-handed types and can be used in any combination; for example, two short swords, or short sword and broadsword, sword and knife, mace and shield, etc. Two-handed weapons cannot be used as a paired weapon. Grand Earl Quingia Ballistia I-I (Commanding Major of the 1st Artillery Cohort of the 1st Legion “The Kings of the 1st”) Raulf Bozkurtlar is the 3rd son and 5th child (the youngest) of the Chieftain of the Iron Claw tribe. His oldest brother, Ulrich is destined to be the next Chieftain and is being groomed as such. The 2nd oldest and middle child, Weylyn is being groomed to be a high priest of the Church of Taut. Being the 3rd male of his family he was destined to service in the military. His oldest sister, 2nd child, is being trained as an ambassador to the various other tribes and nations. His other sister, 4th child, has shown great interest in healing magic and psionics and is being trained by the greatest masters of the healing field. He knows that his entire family will have to die before he will be considered for Chieftain. He is fine with that; he knows he is destined for something else. Although he is the youngest, he is the biggest of his entire family by at least half the next closest. 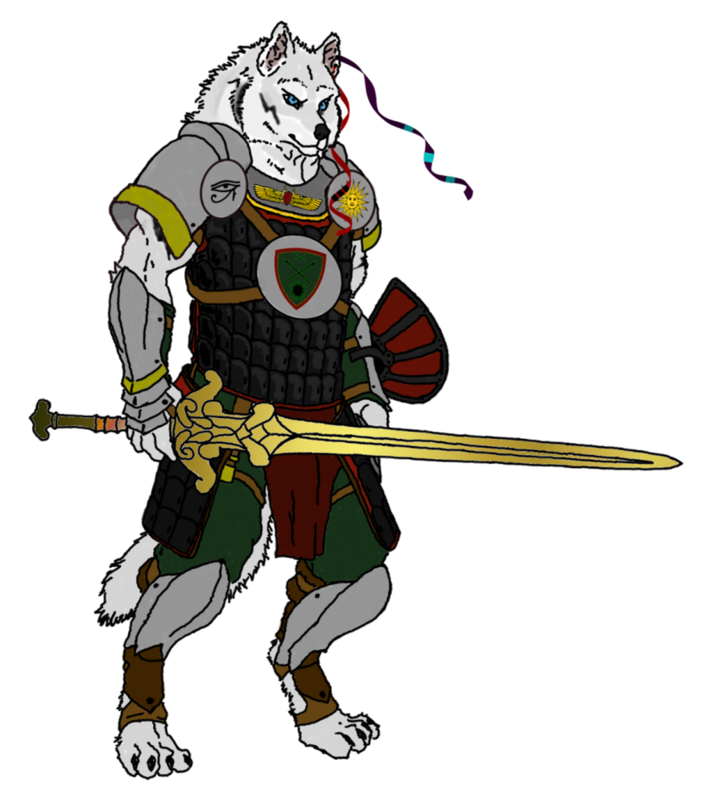 He was sent at a very early age to be trained as a Palladin and military leader. He started out in the Iron Claw Tribal Army but was quickly chosen by the Imperial Army for his leadership and prowess on the battlefield in skirmishes against the Easterns. Even though his entire families are members of The Church of Taut, he just couldn’t find his true faith in The Church. While training as a Palladin, one of his masters was a follower of Ra from the Church of Light and Dark. Raulf would ask his master many questions as to why he followed Ra instead of the Church of Taut. Raulf found he had similar feelings when it came to his faith and upon taking the oath of the Palladin declared his faith in Ra. When Raulf was assigned to his first posting as a Lanipia over a Maniple of ballistae there was a major skirmish with a group of eastern interlopers. His Maniple was assigned as final defense of the command group, a plum assignment. He was given this as the noble son of the Chieftain and being a green Lanipia. The battle was going well for the Wolfen when suddenly a large force, near the size of a cohort, of Light cavalry come charging from the rear flank. It was a disruptive maneuver by the enemy. Not able to get his ballistae battery turned in time, he commanded all his men and several guards of the Legatia and Militaria to grab long pikes and form up around him in a triangle pattern and lock up with each other, with him as the point. They were about the size of two Maniples. He yelled out “By Ra, we shall defend out commanders, no matter the consequences” and led a counter-charge against the lancers. Some of the less brave Eastern soldiers balked at the sight of the Wolfen formation charging back at them, dispersing. When the Wolfen phalanx made contact it was said the noise was like a thunder clap. The Eastern unit was cut down the middle sending humans and horses flying. The carnage and chaos caused enough of a delay to allow the Command group to recall several Maniples of infantry and archers to reinforce the phalanx and beat back the charging force; this lead to the ultimate defeat of the entire Eastern force. Very few of the soldiers of the phalanx were injured or killed. Raulf was heralded as the hero of the battle. His maneuver was nicknamed “The Hand of Ra” because of his beliefs and what he said just before charging. It was also that he, being at point, survived and most of the soldiers that followed his command. He also gained this nickname and so did the Maniple. It is called The Hand of Ra Maniple to this day. His actions, and potential sacrifice, resulted in him being promoted directly to Quingia and given his own Imperial Ballistia Cohort. He continued to serve honorably and develop many groundbreaking artillery maneuvers and tactics. It was almost as though he had divine inspiration. His parents and siblings are very proud of his service and sacrifice. He knows that he does this so that they may be free for their pursuits in the Tribe and Empire. Because he is a follower of Ra and The Church of Light and Dark, he has been ostracized from his family. They are devout followers of The Church of Taut. He still holds the title afforded by his birth, and many in his tribe still respect this title. However he has little to no holdings that originate from the family. He doesn’t feel that he turned his back on his family and noble duty, but that they turned their backs on him. Since the “event” he has concentrated solely on becoming the best soldier and officer he can be. He knows that if something is due to him it will come; because of his hard work, his faith, and his Honor.